Basalt softball coach David Miller talks to the Longhorn players during the second game of Tuesday's home doubleheader against Delta. (Photo by Austin Colbert/The Aspen Times). 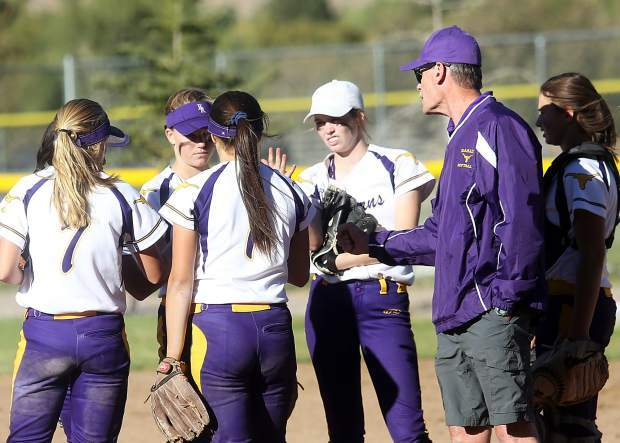 The Basalt High School softball team dropped both games in Tuesday’s home doubleheader against Delta, a critical blow in their bid at a league title. Delta, ranked No. 4 this week in Class 3A by CHSAANow.com, needed a late offensive push to escape Game 1 with a 5-2 win. The Longhorns, who sit just outside the top 10, took the Panthers to the sixth inning in a scoreless game. A home run by Delta sophomore Keely Porter was the game’s big play. Porter finished with four RBI. After scoring two runs in the first inning of Game 2, Basalt couldn’t hang with Delta the rest of the way, an eight-run fourth inning dooming the Longhorns in a 12-2 loss after five innings. Delta improved to 17-2 overall and 10-0 in league play to lock up the league title. Basalt fell to 9-5-1 overall and 5-3-1 in league play. The Longhorns play Wednesday at Meeker, with the winner likely wrapping up second place in the league. The teams played once already this season, BHS winning 9-6 on Sept. 11 in Basalt. The Aspen High School softball team hosted Cedaredge on Tuesday, losing 16-1. AHS fell to 1-12 overall with the loss. The Skiers are scheduled to play Thursday at Palisade. The Aspen High School boys soccer team ended a four-game losing streak with a 7-2 win over host Moffat County on Tuesday in Craig. AHS led 1-0 at halftime before the Bulldogs battled back to get to a 2-2 tie in the second half. From there, the Skiers took control and ran away with the needed win. Henry Morrison and Nate Carricarte each had two goals for the Skiers, while Edgar Ortiz and Max Brenninger had one each. The seventh goal came via an own goal by the Bulldogs. Moffat fell to 0-7 with the loss, while Aspen improved to 3-4 overall. Next up, the Skiers will host Basalt at 7 p.m. on Saturday under the lights on the AHS turf. The Aspen High School boys tennis team routed two of its biggest rivals Tuesday, winning 7-0 over both Steamboat Springs and Vail Mountain. Both matches were played in Vail. The Skiers are scheduled to host Fruita at 4 p.m. Wednesday for senior day on the Aspen Tennis Club courts. There will be a rose ceremony for the seniors at 3:45 p.m.